Even if you don�t have your dream job, every day is precious and filled with opportunities. Make the Most of Your Workday challenges you to actively manage and make the most of workday possibilities and problems. With drive, determination, and optimism, it offers solutions to workday predicaments. You can take control; you don�t have to wait for leaders, people, or circumstances to change. No matter your level, situation, or dilemma, Mary shows you how to regroup, reframe, and bounce back. Make the Most of Your Workday begins with six common scenarios. Can you relate to any of the following challenges? Getting caught up in office dramas. Watching workloads increase while resources decrease. Feeling your interest, enthusiasm, and focus fade. Wanting to avoid working with certain people. Feeling at the mercy of technology. 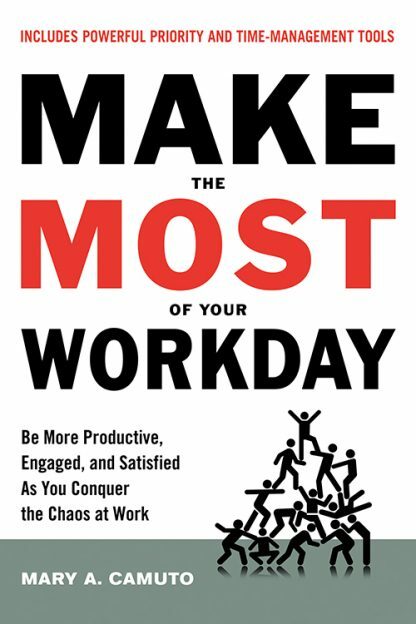 Make the Most of Your Workday contains powerful strategies and tools from several key areas and combines them into a concise practical guide, from strengthening your mindset and self-awareness to identifying needs and goals, from prioritizing your time and energy to communicating effectively and managing the unexpected. Mary A. Camuto is the founder of MC Consulting, a firm specializing in leadership and organization development, training events, and live webinars. Her clients have included thousands of individuals, teams, and leaders from diverse organizations, levels, and generations. Camuto connects in a lively way with her clients� workday frustrations, experiences, and emotions, often tapping her own firsthand experiences working as part of organizations and teams that are understaffed, undergoing drastic changes, or trying to do more with less. She lives in Alexandria, Virginia.